The Schaffner NSG435 is available to buy refurbished used or rent, usually from our UK stock. Click here to download the Schaffner NSG435 datasheet. Combining ease of operation and ergonomic design with exceptionally high functionality, the NSG 435 offers all the features of a comprehensive ESD test system in a compact, light-weight, hand-held instrument. Careful attention has been paid to ergonomic design to ensure that the NSG 435 sits easily in the hand without being tiring or uncomfortable during long or repeated test procedures. The liquid crystal display panel is clearly visible at all times in the working position and all the controls are conveniently at the users fingertips. The NSG 435 is powered by a rechargeable battery supply, so there is no separate high voltage generator or stiff connecting cable to hinder access to the EUT. The battery, which lasts for several days under normal test usage, can be easily interchanged and recharged in just three hours. Microprocessor-based control and a five-key pad give access to the comprehensive range of built-in functions. The liquid crystal display shows the operating status and all userprogrammed test parameters continuously. A discharge pulse counter is incorporated and a further handy feature is the provision of a preset counter for long duration tests and remote use. The NSG 435 has its own high voltage generator producing pulses up to 16.5kV. In addition to the pre-programmed, standard IEC pulses, the user can create custom tests, using single or repetitive discharges with selectable discharge rates and manual or automatic polarity switching. A unique feature is the detection of a real or valid discharge thereby avoiding misleading discharge counts. This is especially important during long term and remote test set up. The NSG 435 also measures and displays the real flash over voltage during air discharge testing. The NSG 435 comes with a 150pF/330 discharge network for tests to IEC 1000-4-2, and a range of interchangeable discharge networks is available for other standards including EN, ANSI-IEEE, ISO, etc. The discharge voltage of up to 16.5kV for air discharges and up to 9kV for contact discharges ensures a comfortable margin over and above the values required for the standard tests. The simulator system is supplied with standard accessories, including interchangeable test fingers, an earthing cable and battery re-charger - all in a durable carrying case. There is an optional fibre optic remote control trigger for operation inside a screened room or enclosure. The LC-display gives the operator a clear, continuous indication of all the test parameters, the operational status of the instrument and the current function of each of the five software-controlled keys as well as discharge voltage - actual or pre-set voltage, with polarity indicator, counter - number of discharges, up-counter or preselection down-counter and battery status - low battery indicator. We offer the refurbished used Schaffner NSG435 ESD Simulator (9kV contact / 16.5kV air) for sale and rental. The Schaffner NSG435 is fully tested and refurbished in our in-house ISO9001 calibration laboratory. We supply manuals, accessories, full warranty and a free-of-charge Certificate of Conformity. 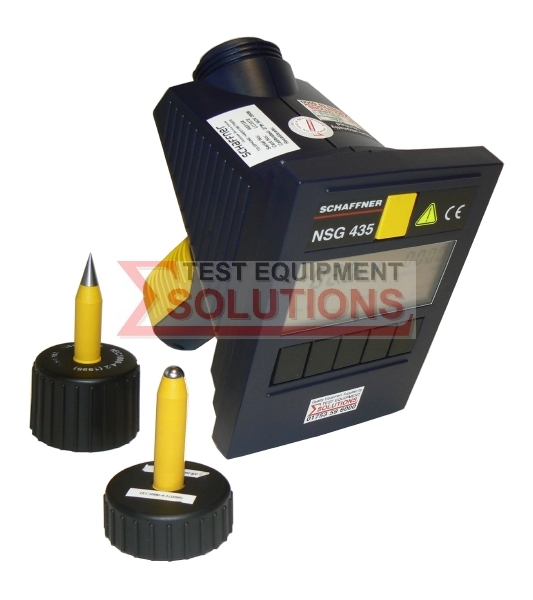 We can also provide the Schaffner NSG435 with a fresh calibration for a small additional charge. If you have under-utilised test equipment talk to us about trading-in or part-exchanging it towards the Schaffner NSG435 or other refurbished test equipment.